I asked a reader what wilted lettuce salad was and she said “Oh…I think I’ve had some of that before. You mean floppy lettuce that was too old to be served and we ate it anyway?” I laughed. Poor girl is from the West Coast, bless her heart. We won’t hold it against my buddy that she’s not southern. But chances are, you’re just like her–and have no idea what a wilted lettuce salad is. Let me help: it’s a spiritual experience in a bowl. When I fed this to my son after I made it, I stuffed a bite in his mouth and as he chewed, he slowly closed his eyes and put his head down. A second later his hand raised in the air. Confused, my husband and I looked at each other. Then we laughed our heads off. Logan was having a moment of praise with his wilted lettuce salad. And he was pretty much right. It’s that good. It’s the “dressing” which I have to think came about as desperate country cooks tried to find ways to use cheap ingredients to make something taste good. This is proof that it can be done. Don’t panic when you see how much bacon grease is in this recipe! You won’t notice it, I promise. Your arteries might–but your mouth won’t. Basically what we are gonna do here is cook some bacon, save some of the drippings, add some vinegar and sugar and onion and heat it up–then pour it over our lettuce so that it softens a bit (okay, wilts). 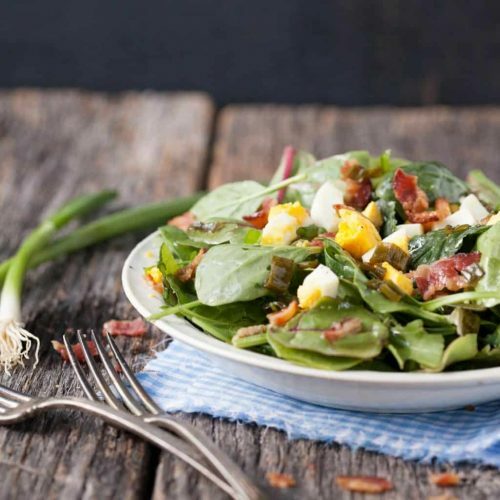 The dressing will almost remind you of cole slaw’s sweet and tangy mix–add the crumbled bacon to the top and a hard boiled egg and it’s just fantastic. It’s also a nice change up from your regular salads and something fun to try on guests when you need some interesting table discussion. You can blame the whole thing on me. 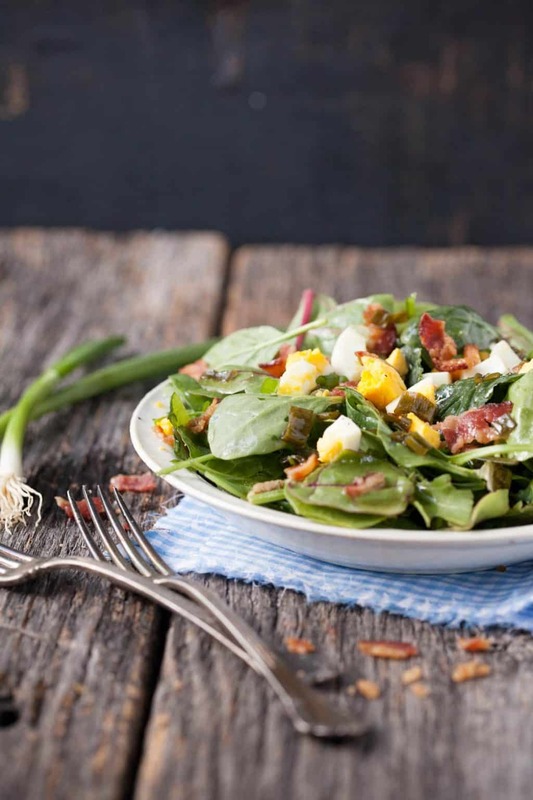 A southern classic, wilted lettuce salad was the way grandmothers used to make do with what they had but the combination of bacon grease (yes that's what I said), vinegar, and sugar makes the most divine dressing served warm over greens. Once you have cooked your bacon and drained all but 1/4 cup bacon drippings from your skillet, return the pan to low heat and add the vinegar, water, sugar, green onions, salt and pepper and stir to dissolve the sugar--about 1 minute. Heat the dressing until very warm but not boiling and turn off the heat. Pour the dressing over your lettuce and toss well. Add the bacon and crumbled egg and serve warm. 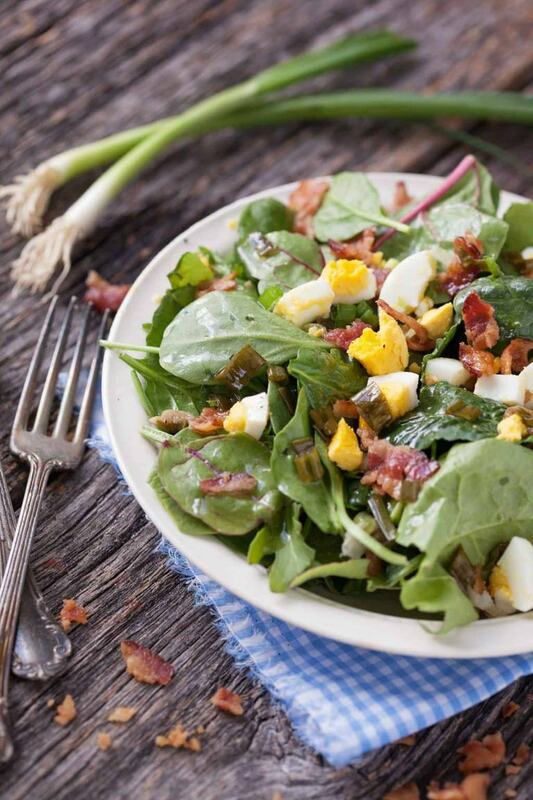 This salad does “hit the spot”! Am making now using escarole. I sprinkle the sugar right on the greens…add thinly sliced mushrooms and more hard boiled eggs. Makes a great side for fried fish or fish and chips! Just careful when you eat it…sometimes I mainline the vinegar and cough! As a child, my mother would make hot wilted salad for my five siblings, dad and I. Such a wonderful treat! She served her salad over mashed potatoes. Did I tell you that we are Irish & had potatoes every night for dinner! YUMMY! We are from Pennsylvania. After my husband & I married, mom would invite us up during the summer months for her delicious, fresh salad. Last night my sister brought us several bags of leaf lettuce. Guess what is on the menu for tomorrow’s dinner! I am from a very small Appalachian town in Kentucky. My grandma’s did their wilted lettace almost like you. There was no salad dressing to be found in their houses, in those days. (1940’s). That was the only salad we had when I was a young girl. I recently fixed some for my husband. Needless to say he loves it as much as I do. Thanks for the memories. OMG…my favorite and we had to have cornbread with it…my family is from Boaz Al. or Sand Mountain we always said…my aunt has now gotten older and the last time I visited her I would volunteer to do all the lettuce green onion and cool the bacon if she would just make the dressing as she can’t stand for a long time anymore and it is all made just like yours but she always saved a little coffee from the morning to add to her dressing and it was the bomb…I need to try to make this one more time with her as I don’t think she will be able to do it much longer…best salad ever I totally understand the spiritual experience when eating this but you must have cornbread with it and I have to say your cornbread recipe is very close to hers. Ahhh the memories! Makes me think of my grandmother!! This is going on the grocery list. I love wilted lettuce!!!! My mama made it all the time during the summer when her garden produced leaf lettuce and green onions. She didn’t make a dressing…she just poured the hot bacon grease over the lettuce and chopped onion. Salted it….perfection. But you had to eat it right away! YUM! Thanks for bringing back a memory! Pinned. I’d say you did have to eat that fast Mary! I hope you’ll give this recipe a try and see if you like it. Thanks for always being such a faithful reader!